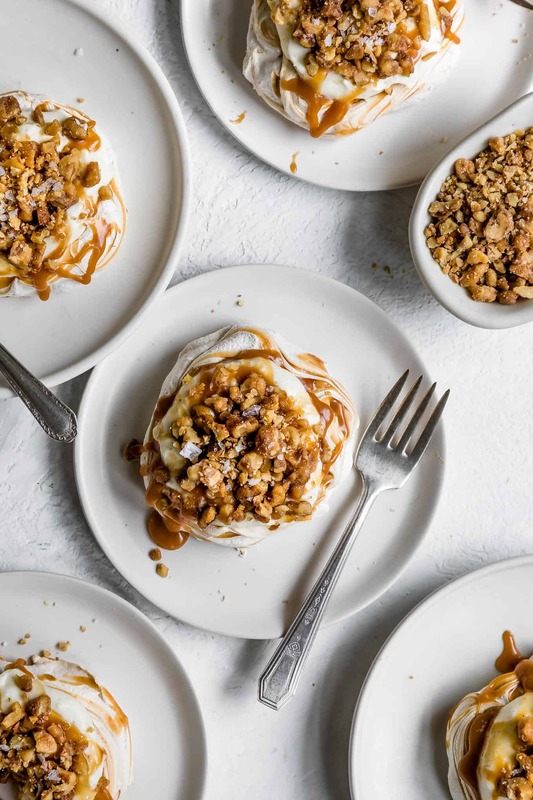 Soft and pillowy caramel swirled mini pavlova cakes with cheesecake mousse, salted caramel sauce, and chopped glazed walnuts. Impress everyone with these meringue cakes that are super easy to make, while seeming sophisticated and decadent! 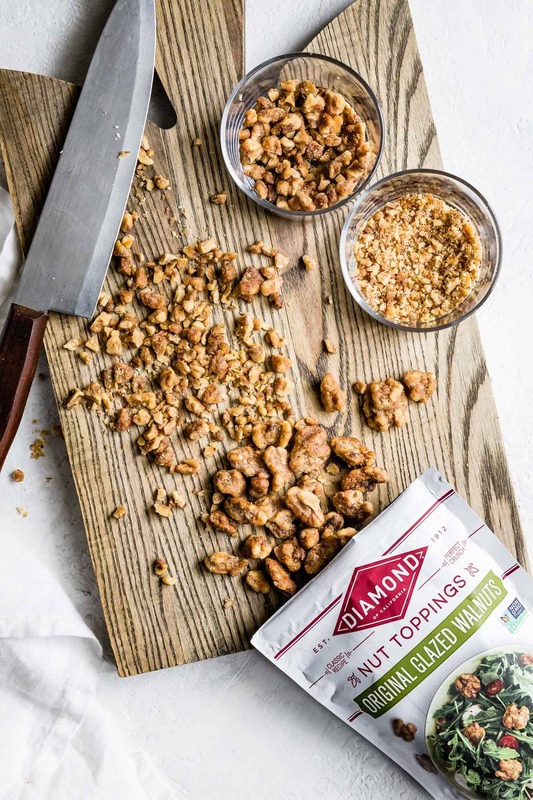 This recipe is made in partnership with Diamond Nuts. You know in old movies where mom rings a dinner bell to call the family in for mealtime? I need one of those but for dessert. And it needs to be loud enough that my neighbors can hear too. “Ding ding ding!” and they all converge on my house with plates. My modern age version is a group text where I simply announce “I have dessert. Come come.” and my neighbors arrive less than 5 minutes later in their slippers. I’d really like a triangle to play instead though. As it is currently, I sometimes accidentally leave my husband off the group text and suddenly several neighbors are inexplicably knocking on our door with plates at 10pm and he’s not wearing pants. Oops. Even after taste testing these pavlovas two days in a row, he still inquired few days later about when I’d be testing them again. Then was very disappointed when I told him they’d been photographed and were all ready to go. 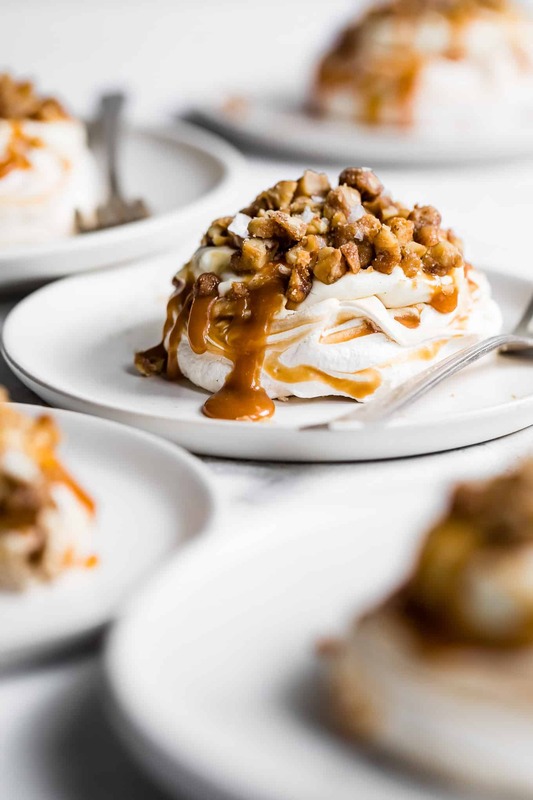 These salted caramel cheesecake mini pavlova cakes are the fourth in a year-long partnership with Diamond Nuts. First I made poppy seed almond flour muffins with peaches (sub frozen cranberries when peaches are out of season or leave the fruit out all together!). Then I made maple roasted carrots with walnuts and feta and baked gluten-free chocolate-dipped pecan shortbread cookies. 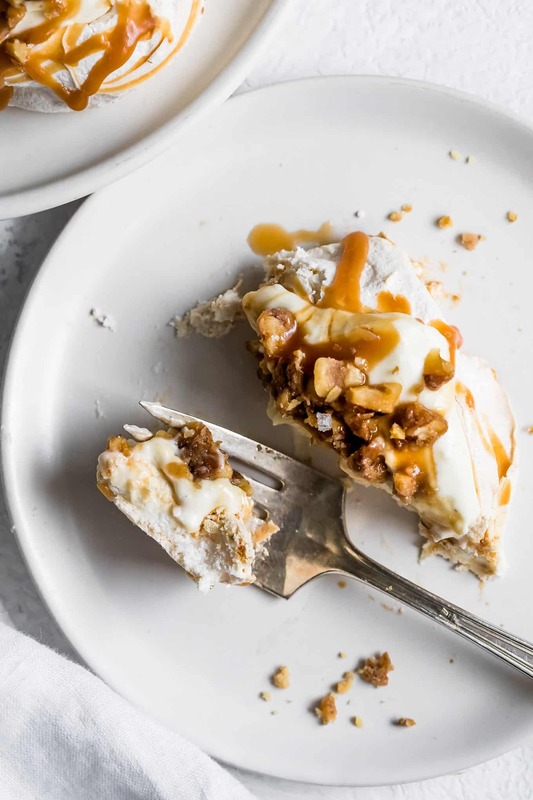 Now, I’m diving head first into full decadence with these salted caramel cheese cake mini pavlova cakes topped with glazed walnuts. Make these mini cakes for celebrations or dinner parties where you want a sophisticated but easy dessert. Where you want to impress. (Ahem, Valentine’s Day? A special birthday? MY birthday?). But what is a pavlova cake? It’s a baked meringue-based cake with the crisp shell and a pillowy marshmallow-like center. Cracking the shell gives way to cloud-like airy filling with a slight chewy texture. A bit of corn starch added to the meringue helps to stabilize the egg whites and creates the chewy marshmallowy center. Traditionally pavlova cakes are topped with whipped cream and fruit. Here we’re mixing things up by swirling in salted caramel to the meringue and topping them with whipped cheesecake and glazed nuts. These toppings create a texturally delicious dessert. If you search “pavlova recipes” you’ll mostly find recipes that make one giant pavlova cake, ready to slice into wedges. Once cut, it’s a messy dessert. Here I’ve scaled down my recipe to create six petite individual pavlova cakes that you can assemble quickly when you’re ready to serve. They have the same texture as the larger cake, but give each person a bit more of the crisp shell. Rather than whipped cream, I’ve topped these pavlova cakes with a whipped salted caramel cheesecake layer. A fluffy vanilla bean cheesecake mousse topped with a drizzle of salted caramel sauce. The cheesecake layer adds tartness to the cake that balances the sugary pavlova and salted caramel sauce. 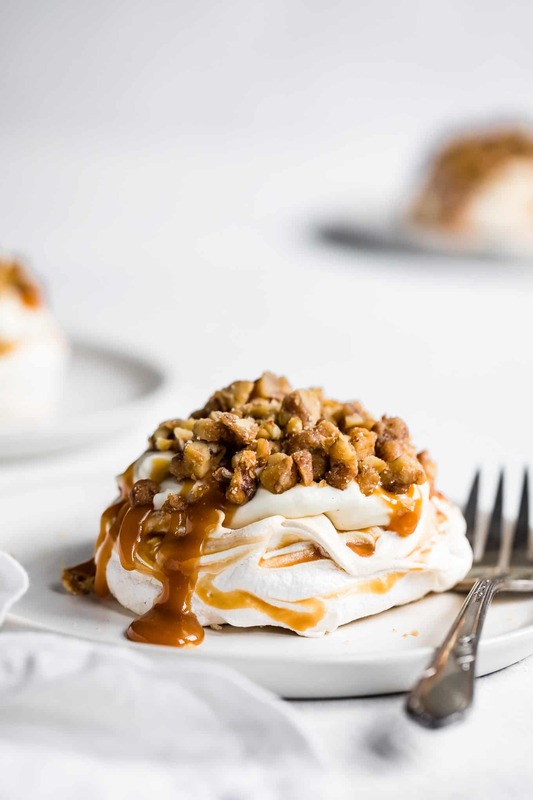 These cakes come together with a delicately crispy and chewy meringue-like pavlova base topped with a soft vanilla bean cheesecake and gooey salted caramel sauce. The crunchy chopped glazed walnuts on top are the real focal point. 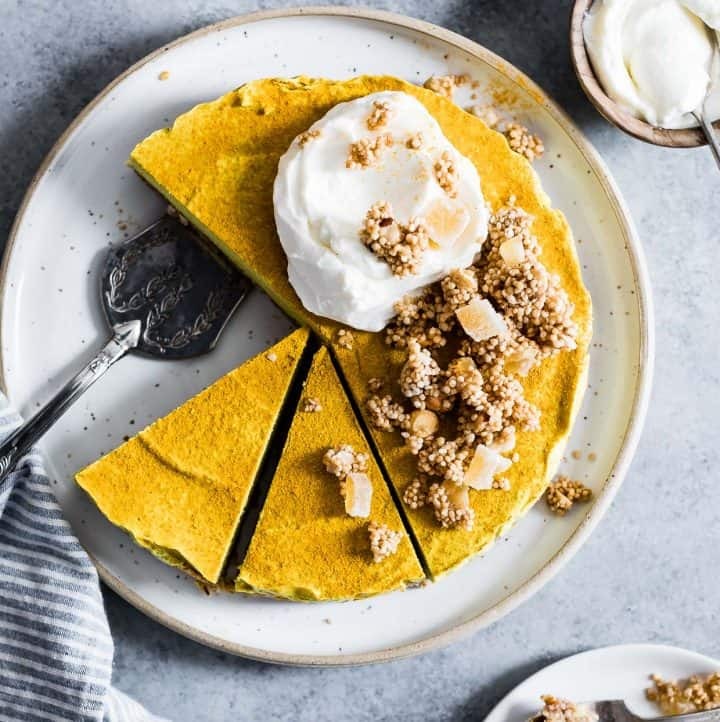 They complete the range of textures and add a sweet toasted nutty layer that makes the pavlova cake taste a little like a ritzy sundae meets a candy bar. Except without chocolate, these cakes are candied walnut-forward. These original glazed walnuts from Diamond Nuts are my weakness. I can’t open the pantry without grabbing a small handful as a snack. All day long. And Zoella agrees – she calls them “special nuts” and regularly requests a small bowl as dessert. 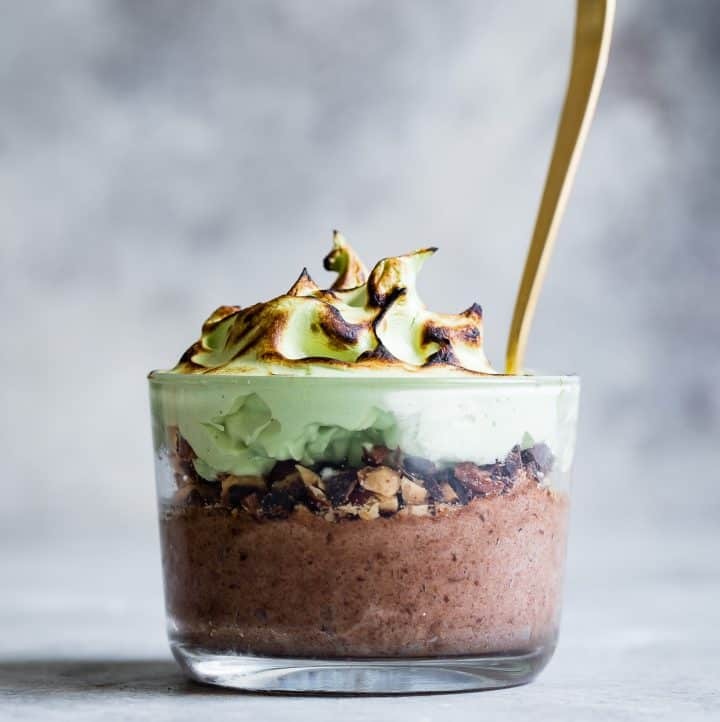 Nut toppings like glazed walnuts are often tossed on salads or yogurt, but pairing them with dessert is an easy way to add a savory sweet note that elevates the recipe. 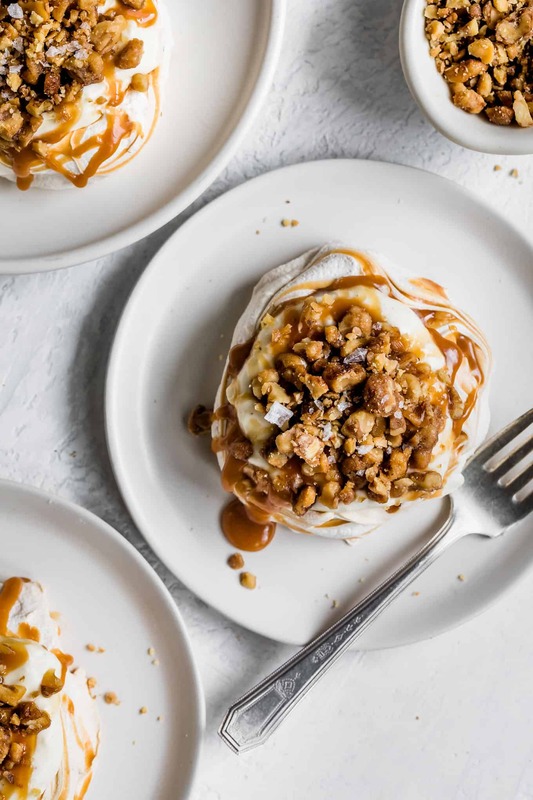 With a light and creamy dessert like these pavlovas with whipped cheesecake, the roasted chopped glazed walnuts add crunch and drive the flavor. 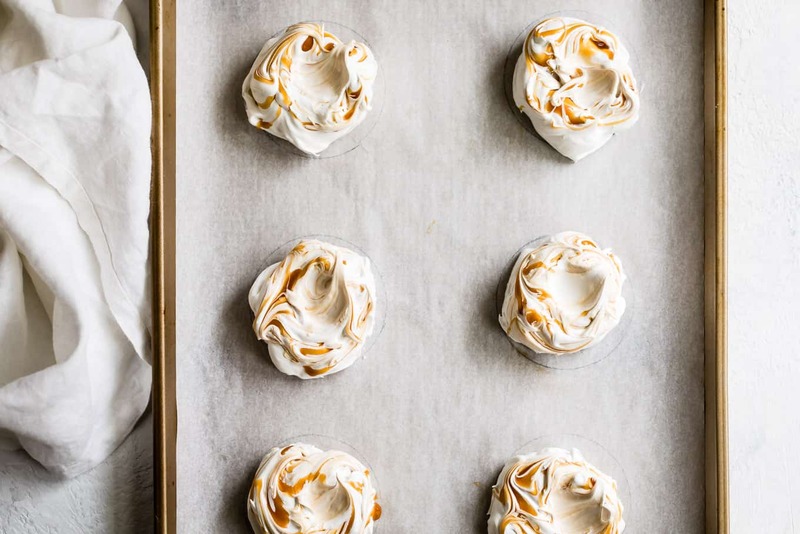 This small-batch recipe is perfectly portioned to make six mini pavlovas. If you’re planning a special dinner just for two though, just keep all the toppings separate in the fridge and assemble to serve! Or ring the dessert bell and surely someone will come to eat the other four. 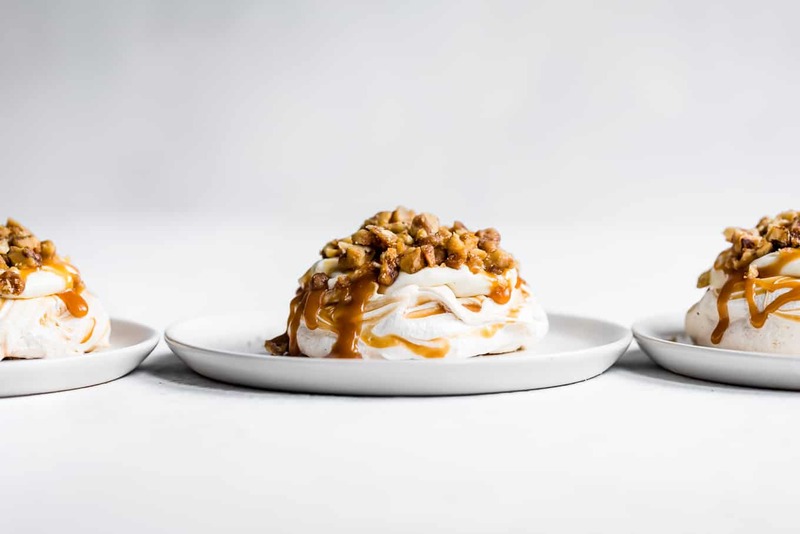 To watch me make these individual pavlovas (and make awkward eye contact), tune into IGTV January 28th at 12pm! Disclosure: Special thanks to Diamond Nuts for providing the ingredients for this recipe and sponsoring this post! And thanks to you for supporting the companies that keep Snixy Kitchen cooking! 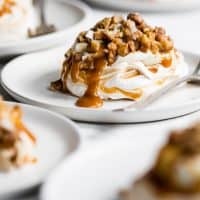 Soft and pillowy caramel swirled mini pavlova cakes with salted caramel sauce, cheesecake mousse, and chopped glazed walnuts. 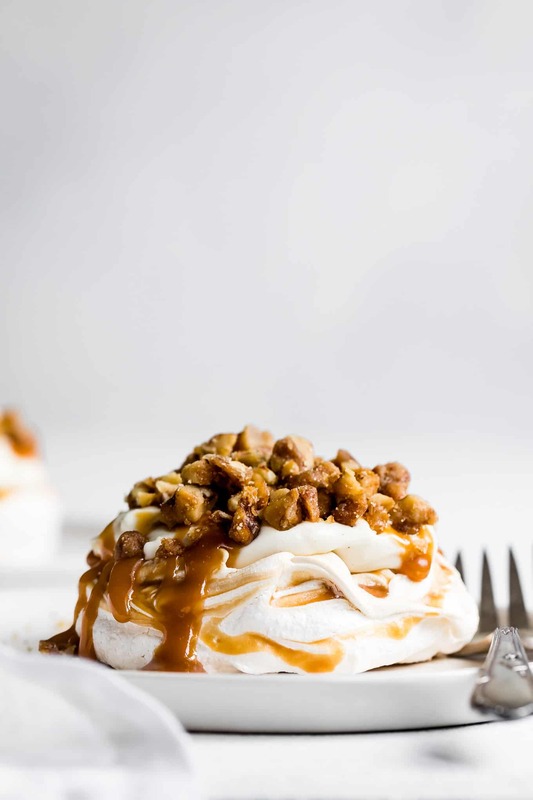 Impress everyone with these meringue cakes that are super easy to make, while seeming decadent and sophisticated! If making homemade caramel sauce, do that first and let it cool. Trace six 2-inch circles on a sheet of parchment paper, about 2 inches apart. Place the parchment paper upside down on a baking sheet so you can see the circles, but won't get ink or pencil on your food. Preheat the oven to 250°F. Mix together the corn starch and sugar in a small bowl and set aside. Make sure your stand mixer bowl is completely clean. In the bowl of the stand mixer or with a hand mixer, whisk the egg whites, cream of tartar, and salt on medium-low speed until soft peaks form. With the speed on medium-high, slowly pour in the sugar and corn starch mixture in a continuous stream. Increasing the speed to high, add the vanilla extract, and whip until stiff, shiny peaks form. Use a spatula to dollop the whipped meringue into mounds on the circles of your parchment paper. Prepare your caramel sauce. You want your caramel sauce to be thin enough to drizzle, but not hot or warm. If needed, give it a 5-10 second zap in the microwave to soften. 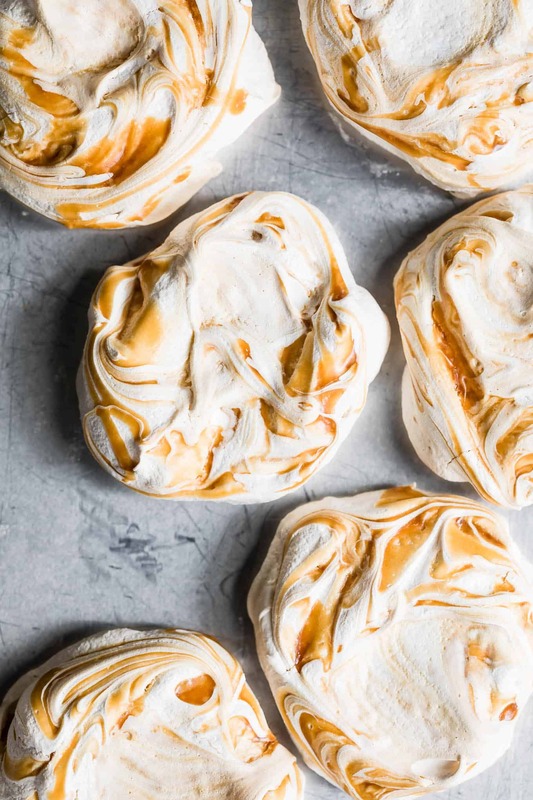 Working one at a time, drizzle 1/2 teaspoon caramel sauce on each meringue mound then use a toothpick, skewer, or chopstick to swirl and shape the meringue as desired. Use the back of a spoon to put a small indent in the center of each meringue (to help the toppings stay on top once baked). 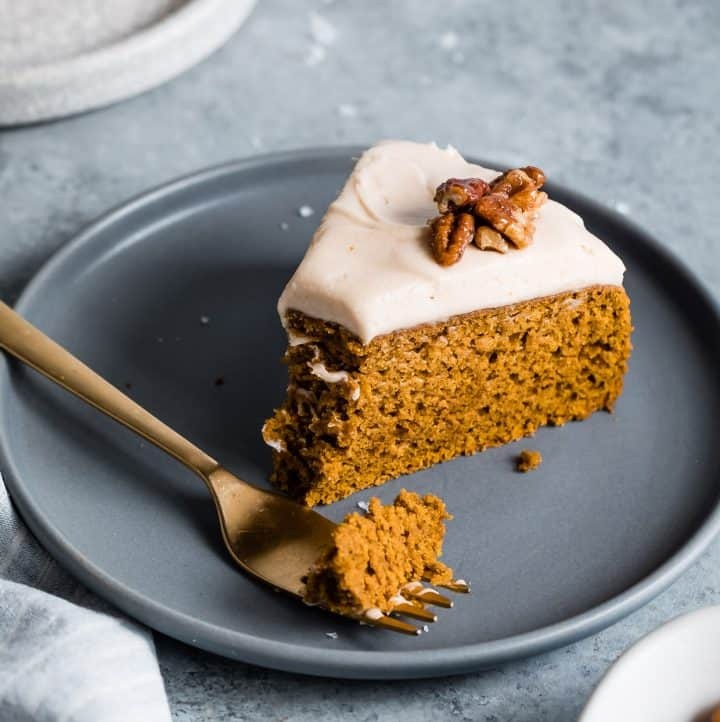 In the bowl of a stand mixer fitted with the whisk attachment or a hand mixer, whip the cream on medium high speed until it begins to get frothy. Add the vanilla paste and salt and whip just until it forms soft pillowy peaks. Transfer the whipped cream to a mixing bowl and set aside. Without cleaning the stand mixer bowl, add the cream cheese and beat on medium high speed using the paddle attachment until soft and smooth. Scrape down the sides as needed and beat in the sugar. With the mixer on medium-low speed, slowly add the whipped cream, a little bit at a time and fold just until completely smooth. Chill while the meringues bake. *Superfine baker's sugar will dissolve easier in the meringue, but if you don't have it, you can also use granulated cane sugar. ***The mini pavlova cakes will keep for a couple of days in an airtight container in the fridge before without toppings. Once you add the toppings, they'll become less crisp over time, so its best to top them just before serving. 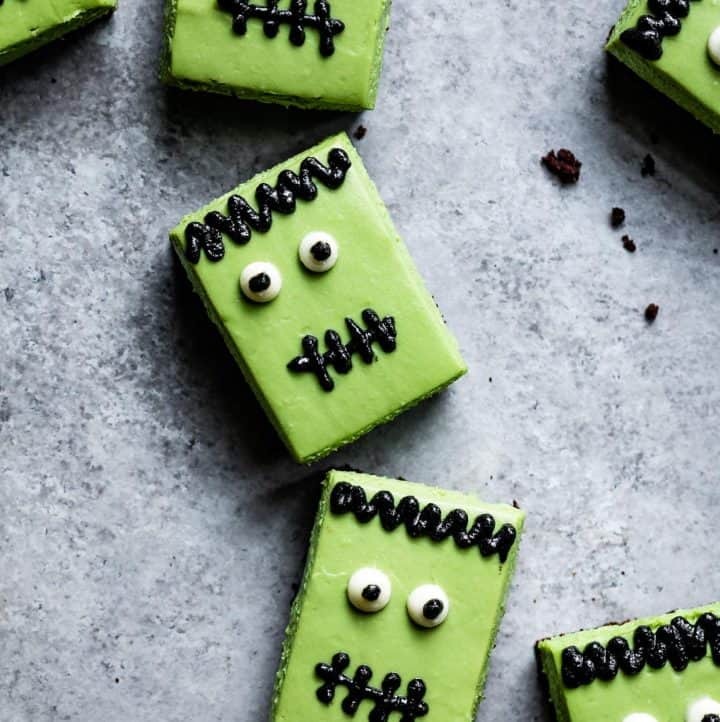 These look absolutely incredible Sarah! I love the combination of flavors and textures! Were a perfect Valentine Day’s dessert! My hand mixer is still exhausted but they were wonderful! A unique dessert. Thank you!